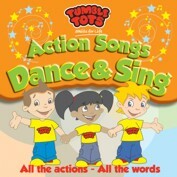 Volume 4 in our Action Songs Series brings you lots more great songs to dance and sing along to. As usual we have included all the words and actions in the booklet so you and your little ones can get fully involved in the fun! !